Increasingly often, the choice of shopping centre is influenced not only by a wide fashion offer, but also by the gastronomic options. Consumers’ awareness is growing together with their expectations, which is reflected in the latest report by CBRE and research into shopping centres carried out by Inquiry. For several years, food courts, i.e. those parts of shopping centres with a gastronomic offer, have been playing an increasingly important role in shaping their perception. The relationship between a catering zone and the overall image of a shopping centre has been examined by CBRE, which commissioned a survey of over a thousand respondents across Poland. The report “Coś na ząb – jak jemy, gdy kupujemy” (“Something to eat – how we eat when we buy”) describes the culinary habits and preferences of Polish visitors to shopping centres. 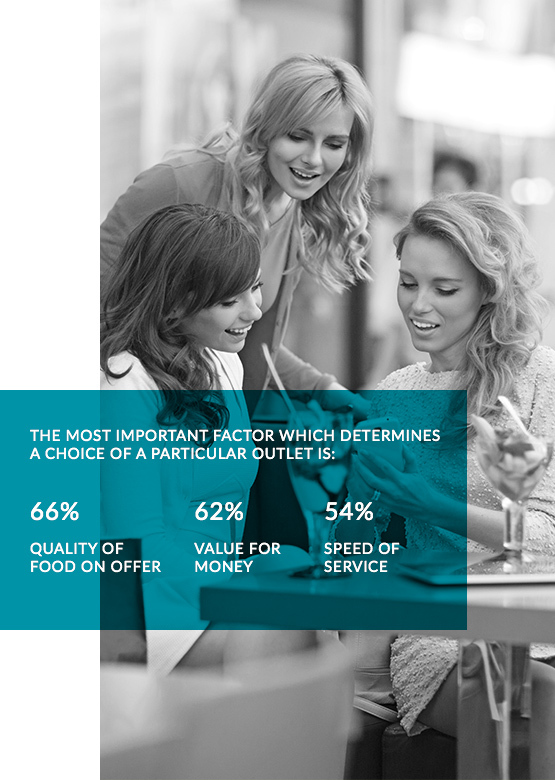 According to the research, the most important factor which determines a choice of a particular outlet is the quality of food on offer; such an answer was given by 66 percent of respondents. The second place went to value for money, as indicated by 62 percent of the respondents, while the third place belonged to speed of service (54 percent of the respondents). “In recent years, along with the increasing affluence of society, we have been able to see a change in consumer habits. Entertainment and leisure activities are an important part of everyday life, and eating out is becoming increasingly popular. The gastronomic offer in shopping centres is much wider than a few years ago,” says Agata Czarnecka from the Consulting and Market Analysis Department of CBRE. Reading the report, we can also learn that a visit to a restaurant or a café is the second most frequently performed activity when visiting a shopping centre, right after shopping. Shopping centres with the best mix of catering outlets can make as much as 15% of their turnover from the food court, as a majority of visitors spend money on eating/drinking there. More and more often, shopping centre managers take changing consumer habits into consideration and adjust the food court zones to trends in the market, e.g. extending the gastronomic offer to include facilities serving vegetarian or gluten-free dishes. 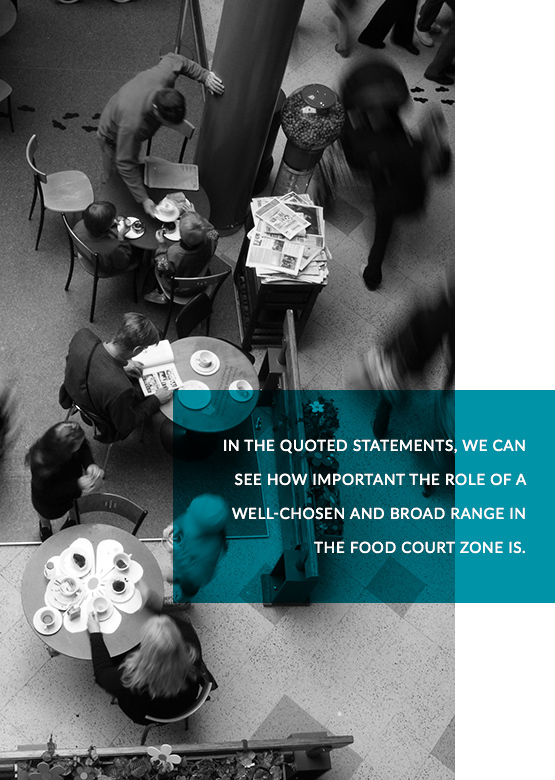 In the quoted statements, we can see how important the role of a well-chosen and broad range in the food court zone is. It can be a magnet, attracting entire families to the centre, but it can also discourage them from visiting the place. Especially where there is intense competition between shopping centres, a good gastronomic offer can tip the balance. We should also remember that if a shopping centre is also to be a meeting place, especially for slightly older consumer groups, an important ingredient is cosy facilities, where people can spend time with their family or friends, without being exposed to public view. Restaurants and cafés do not have to be located only within a standard food court. Finally, we would like to emphasise that it is the gastronomic offer that enables the appropriate positioning of the centre. While it is difficult to make a clear differentiation of the tenant mix in the Polish market, the choice of specific restaurants and cafés can be a decisive factor in perceptions of the centre. You can read more about segmentation of customers in shopping centres and their needs, also in relation to gastronomy, in our report, “Kto odwiedza Twoje centrum handlowe” (“Who visits your shopping centre”).